I am trying to understand the great personality of Swami Vivekananda . In the end days , when he give his spiritual education to whole world . Then he leave his physical body by going the position of trance . He went there time by time from ist step yem ,neyam , asan , parayam , pratiahar darna , dyan , and smadhi . He took a great smadhi that is called trance . His thought are the real asset for youth . I am also youth my name is Vinod kumar . 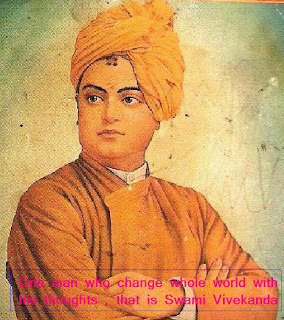 Swami Vivekananda is my real hero . I love him very much . I read his great book . His thought give me power to fight with my internal enemies . I think that today , he is saying me ,” Dear Vinod , Why are you sleeping , awake now . Whole world’s problems , you can only solve. Why was Swami Vivekananda great? I am very happy to read your post! My life is also permeated with his thoughts and teachings.May he give us the strength to practise his teachings.Jai Swami Vivekananda!